Sterling Silver / 14K Gold Chocolate Diamond Moveable Ring.0.2200ctPrice includes 30% discount. A lavish testament to your distinctive style. This moveable ring is crafted in polished sterling silver / 14K yellow gold. It features one full round cut chocolate diamond in a bezel setting. The total diamond weight is approximately 0.32ct. The setting size is 9/16" x 13/16" with a height of 3/16". This is my second ring from Sonia, sad to say that I lost my first. I had been eyeing this ring for years and since I did lose the other one had an excuse to order this one. I am so happy! 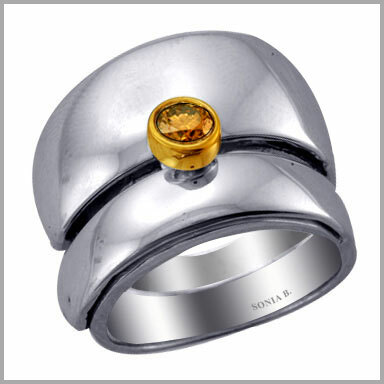 I am glad that Sonia does a silver with gold line that more people like me can afford to wear her exciting and unique designs. 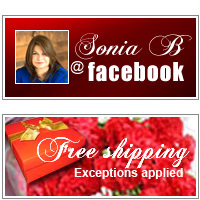 Thank you Sonia, what a great Christmas present to me!